Disclosure: I was given free admission to this conference in exchange for the post. However, all opinions are my own. If you’re a blogger, you’ve probably heard about all the different conferences that go on throughout the year. Earlier this year, I had the opportunity to go to the Build Your Blog Conference, put on by the Six Sisters. It was amazing! Unfortunately, we can’t really afford to fly to other conferences around the country AND pay for the conference fee. We’ve got a baby to feed! So that’s why I think the idea of an online blog conference is BRILLIANT. I attended an amazing one last year, the Online Blog Con (which is coming up again at the end of this year…more on that later though.) It is so nice to be able to attend a conference, from the comfort of my home. Especially because the information is always SO great. And let me tell you, some of the connections I made from the online conference I attended have been priceless. Some might be hesitant to attend an online conference, because of the lack of interaction with other bloggers and advertisers. However, that is simply not the case! As you can see, the agenda says there will be a Twitter Party and Google Hangout at the beginning, and it is broadcast by live feed in a private conference feed. There will be a live chat feed which will allow viewers to interact with speakers. I mentioned before that I have made some incredible connections (and friends!) from the online blog conference I attended, and I imagine it will be the same with this. Here is a video with more information. 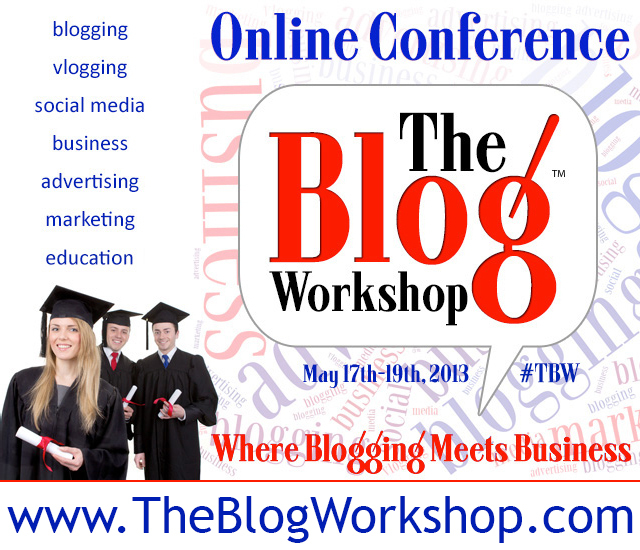 The usual price for this conference is $175, but with the discount code TBW25HURRY, you can get 25 dollars off. The code expires April 26th, so be sure to register now. Registration includes three days of amazing speakers, the Blog Workshop’s resource list, a conference workbook, and conference tee. If you have any questions, there is a great FAQ that can be accessed here. And register now! The conference will be held on May 17th-19th, so it’s coming right up!